The following is a guide made from my own observations, together with excellent technical feedback provided by Randall Benson; information and images found on Kevin Chan’s Seiko Diver’s Reference; and further feedback [most notably from] from Luka-San, Cobrajet, and too many others to mention. I flagrantly "borrowed" some pictures that were posted to the forum, I hope you don&#039;t mind my using them here. Thanks all of you for your inputs. Please note that the guide focuses solely on 6309 dive watches and does not address the Japan only 6306 variant of the watch. Please feel free to add any information and images you feel are worth adding. The Seiko 6309 series of diving watches is the third generation of Seiko’s (normally aspirated) professional/recreational diving watches (this does not include Seiko’s deep diving shrouded divers). The 6309 line of divers replaced the 6105 in 1976 and ran until 1988, when it was replaced by the 7002 line of divers. The 6309’s are largely an economizing and further modularization of the 6105 movement, which allowed for greater robustness, longetivity and ease of maintenance. The 6309’s (especially the second generation of them) introduced many design changes to Seiko divers that are with us to this day. This variant comes in a large and thick stainless steel cushion case measuring approximately 45mm in width (48mm including the crown); 48mm in length (lug to lug); 13mm in thickness; and 22mm in lug width. The case has a machined/satin finish and is composed of a combination of softly curved surfaces. There are two main creases on the case. The first are found on either side of the case, where the bottom of the case curves upward and meets the downward slope of the upper part of the case. There is a second, small and less sharply defined crease running along the upper inner lip of the crown recess. The creases along the sides of the case should be well defined (though not razor sharp), while those in the crown recess are slightly less sharp. Both tend to get rounded-off (the recess creases can sometimes disappear entirely) when cases are improperly refinished. 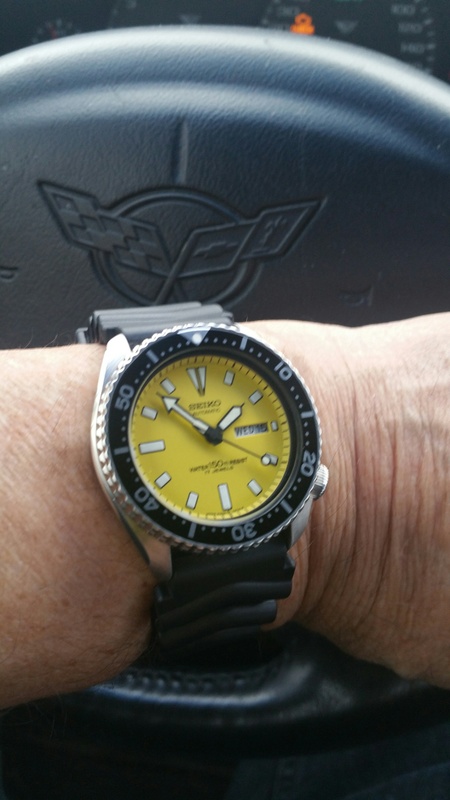 These watches have integrated threaded crown tubes which are intended to accommodate a thick telescoping screw-down type crown and tube (previous Seiko divers used a turn-&-lock type of system). It is important to note that damaged crown tubes cannot be replaced. Depending on the type and extent of the damage, a bad crown tube can destroy an otherwise great looking case. Since so many of these watches were sold in and/or used in humid environments, it is very important to examine both the inside and outside of the case for signs of rust and in particular, rust related pitting. Mild surface rust can be cleaned; pitting can be a sign of much more extensive damage and can ruin a case. Pay particular attention to corrosion to the inside of the case; under the gasket sealing areas of the case; to the flat surface where the gasket sits on the case-back; and to the threads where the case-back screws in. Corrosion in these areas is common on these watches. A little bit of pitting on the threads can be halted, but too much can prevent the case-back from closing properly or can allow water to enter the watch when placed under increased water pressure. With new seals a case with slight rust damage to gasket sealing areas can be dust sealed, but probably not be made water-resistant. IF YOU WANT A WATER RESISTANT CASE GET ONE WITH NO RUST. Since the majority of you are desk divers; price is often an issue; and this is a vintage diver; you might be ok with a little bit of thread damage so long as the watch can be dust sealed - just avoid getting them wet, no matter how nice they look. Lastly, rust can also be an issue with regard to lug-pin holes. This part tend to have a greater potential for rust damage than most others. In order to correct rust damage, unscrupulous repairmen tend to just drill the holes to a bigger size. The problem with this is that eventually, the lug-pin holes get so large and worn out that it would be insane to expect a spring bar to stay in them. This is not fixable, and means the case is junk (unless you want to drill all the way through and manufacture your own screw type springbars – I didn’t think so). Crown is a thick, horizontally toothed (for ease of finger-grip), unsigned, 2-piece telescopic design. Make sure that the crown is not mounted directly on the crown-stem (as with 7002 and later models of seiko divers). The proper set-up should have the crown mounted on a 2-piece telescopic crown-stem with a spring and a washer. The crown should screw down a minimum of 1.5 complete turns (more is preferable). Any less than 1.5 turns and the threads are most likely damaged and you would be wise to avoid this case. However, quite often crown turning problems tend to be caused by damaged crown threads (those on the inner/underside of the crown) and not the threads on the case’s crown-tube. If you have a problem are advised to check before throwing out that case, for the crown IS easily replaceable. The bezel ring itself is bordered by two stacked rows of rectangular cut protrusions that aid with finger-grip during bezel turning. If you look closely at the bottom of the bezel (where it meets the case) you will notice that ORIGINAL bezels are not flat, but rather have a series tiny incisions/dimples which should be centered with the centerline of the rectangular finger grips – aftermarket bezels sometimes lack these. If you buy a 6309 with a non-turning bezel, don’t be disheartened, again, this should be a relatively simple fix and should not be a deal breaker. The crystal should be a Seiko Hardlex mineral crystal. It&#039;s supposed to be flat, have a frosted beveled edge, and should only protrude a minute amount beyond the top of the inner edge of the bezel – but never beyond the outer edge of the bezel. Examples offered on eBay often have after-market crystals which noticeably project (stick out) above the bezel; or use a domed acrylic crystal with curved edges. Proper aftermarket and Hardlex replacements do exist and can be sourced. After market sapphire crystals are popular and desirable modification, so don’t dismiss a domed crystal as undesirable – always ask the seller what type of crystal you are looking at. A note on crystals, the crystal retaining ring on these watches have a tendency to split as a result of age and exposure. These are very hard to find in usuable condition, and when they do come up, can be expensive to replace. Contact one of our experts about finding suitable replacements. The case-back is a variation of Seiko’s standard 6-slot screw-type case-back. It is made of stainless steel and has a raised relief stamping of the full sized Seiko tsunami wave in the center. 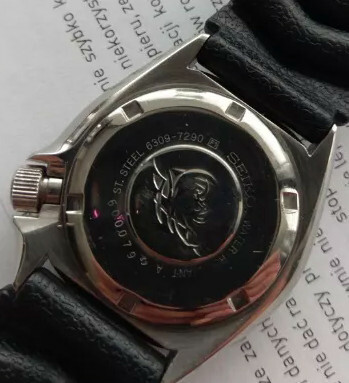 Deeply stamped (looking almost engraved) in a clockwise circular layout around the image of the wave are the words: ST. STEEL 6309-7040 (or 7049 depending on which model you have) SEIKO (in larger font) WATER RESIST. Early 6309-704*s (1976 to approximately 1980) should say "Japan A" following the words water resist. Later ones (1980 to approximately 1988) should just be marked "A" without the "Japan". In either case, this should be followed by a Suwa logo (when worn out, this logo tends to take on the appearance of a pair of 1’s inversely facing each other). Below the image of the wave, deeply stamped (looking almost engraved) in a standard left to right horizontal layout is the watch’s specific, six-digit serial number. Please note that the Suwa symbol is not present in 6309 case-backs. Often times when case-backs are refinished, the stamped information gets sanded to the point of looking worn or faded. It is supposed to be sharply stamped, and it is never laser etched. The faces of this version are characterized by round hour markers at 1,2,4,5,7,8,10 & 11; Bell-shaped hour markers at 6 & 9; and a two-piece rounded triangular 12:00 marker that is divided by a an inverted cross. There is no 3:00 marker. Instead, there is a large rectangular window with beveled edges that exposes a pair of white day and date wheels (the edge on this window can be highly beveled or more mildly beveled, but it is ALWAYs beveled). The day/date wheels are most commonly found in English/Spanish combinations, but they also come in English/Arabic, English/German, English/French, and possibly other combinations. Day/date wheels are also believed to come in English/Kanji, however there is a bit of dispute on this from our contributors. As of this writting the consensus is that although most likely available, they are definitely not common, since the English/Kanji day/date wheel was also exclusively used in the Japan-only 6306 derivative. All hour markers are lumed (except for 3:00 of course). However, it must be noted that the lume is relatively flat and does not occupy the entire hour marker. Original factory lume, as seen in the picture below, has an almost textile looking quality to it, almost like it is linen, with slight cross hatching visible when viewed with a strong loupe (this is from the printing process Seiko used). “JAPAN 6309-704LT” and have the Suwa symbol directly above the 6 o’clock marker. As of this writing, reproductions of this particular dial have not really been seen by our forum experts and restorers, however don’t be surprised if they are be copied in the near future. When production of these watches was moved to Singapore in the early 1980`s, two more different dial codes were introduced, depending on the market the watch was destined for. Attention MUST be paid to the length of the text, as reproduction dials do not completely fill the area between 7 and 5 o’clock; often omit some of the words; and/or abbreviate HONG KONG to read “Hong Ko”. These are reproductions. "6309-704X T (suwa symbol) MOV&#039;T JAPAN CASED HONG KONG"
"6309-704L T (Suwa Symbol) MOVT JAPAN CASED HONG KONG"
You do have to be careful with this dial code, for this combination is the one that gets knocked of the most as the infamous "Hong Ko" dials. I have not been able to nail the exact story behind this dial code yet. Attention MUST be paid to the size of the Suwa symbol, as reproduction dials have a slightly larger symbol. All the watch’s hands are polished metallic hands and are silver in color. Their general shape can be seen in the picture above. The hour and minute hands each have a large lume insert in the middle that follows the shape of the hand. The second hand only has a lume dot near its outer end. Like with the hour markers, the lume used on the hands is not puffy. Unlike the hour markers, the lume on the hands fills the entire space of the insert. Original 6309 hands are completely flat, and have very sharp edges resulting from the precision stampings they where made from. Aftermarket hands will have rough somewhat sloppy edges, the result of sloppy reproduction stamping and tooling. Replacement hands from Seiko will have a three dimensional appearance, and where intended for Seikos latter SKX series of watches. 1) The movement has to look clean with no black, pitted or rusted parts. This is especially true of the main-barrel, which should have a shiny (not-polished) stainless steel color. A brass color coming through is often an indication of play in the main barrel. This is a common problem on heavily used 6309&#039;s. A brassy color on the outside of the movement can also be indicative of play in the bearing of the rotor. 2) The condition of the movement spacer and pressure spring. These tension/pressure springs are the first thing to rust when water is allowed to stay in the case. They are thin, and often turn to dust. These are long obsolete, and finding a good one is a chore not unlike trying to find a new crystal retainer. 6309’s where only offered with black, straight vented rubber straps. 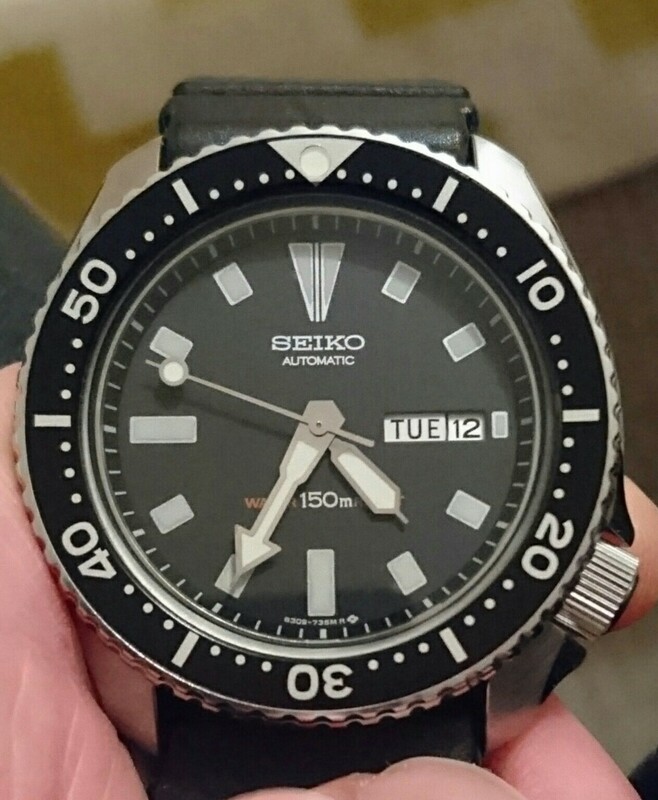 The long strap has two vents separated by flat ridges; and 11 adjustment holes followed by an image of the Seiko tsunami wave inside a recessed circle, near the rounded tip. The short strap has 3 vents separated by flat ridges; 3 offset rows of non-usable perforations and an unattached rectangular strap-guard with 5 similar perforations. The end is followed by a smallish (for the watch) traditional buckle set-up with the words SEIKO.ST.STEEL.JAPAN.Z on the underside. Some people strive for originality and must have an original strap. The original strap should be marked "SEIKO GL-831 JAPAN". Seiko made them of a silicone rubber compound. Today, the market is flooded with replacement rubber straps from all kinds of sources. I would not suggest stressing over the correct rubber strap and would advice that you find a good after market replacement. It’s worth noting that Seiko divers use “FAT” spring-bars. These are not regular 22mm spring-bars, but rather heavy duty 22mm spring-bars made especially for Seiko divers. - 6309-729B? : very rare orange dialed model. This generation comes in a smaller and thinner stainless steel case measuring approximately 41mm in width (47mm including the crown); 45mm in length (lug to lug); 13mm in thickness; and 22mm in lug width. The main difference between the cushion style and the slimmed-down cases is that the slimmed-down cases do away with the excess metal protruding from the case, outboard of the bezel edge, making the watch appear thinner. These cases also incorporate a small blister shaped guard which protects the crown and is somewhat reminiscent of the much larger guard found on vintage 6105 divers. Otherwise, both generations see little by way of physical changes. The faces of this version are characterized by rectangular hour markers at 1,2,4,5,7,8,10 & 11; Larger rectangular hour markers at 6 & 9; a two-piece pointed triangular 12:00 marker that is divided by a line; and a tiny rectangular 3:00 marker just to the right of the day/date window. All hour markers are lumed. However, it must be noted that the lume is relatively flat and does not occupy the entire hour marker. It’s worth mentioning that in the 6309-729B dial, besides it’s being orange, the words WATER & RESIST are blue, not red. The words SEIKO, AUTOMATIC, 150 and the dial code are written in black. EBay listings often claim that these watches are rare. That is just not true. They are, however, in high demand from collectors in Europe and North America. This is especially true of examples in good condition. When buying a 6309 do yourself a favor and spend the money to buy the best example you can find. Buying a mediocre one and paying for restoration can get more expensive than if you had done your homework to begin with. Try to keep your purchase price from eBay at no more than $250.00-$300.00 for a good clean example in good working order (keeping in mind the additional expense of servicing or overhaul that it will definitely need). For a perfect example, or a nicely restored example (from a well known restorer), expect to pay as much as $400-500 depending on the level of restoration and the particular variant of the watch (that price should include the cost of the watch plus the cost of a full restoration with original parts, as well as an original strap, and a perfect bezel insert). hi.. found this interesting and potentially useful as will be getting one of these soon hopefully but can't get any images up,is it me or have they gone,have found a few posts where the word [IMG] appears where i assume there was a picture,is this to save on server space? or is my computer missing something software related? A very informative great resource, but most of the pictures are long gone. Would anyone care to guestimate the price decay due to aftermarket parts (hands, dial, bezel, etc)? I plan to desk dive the watch only and have no dreams of having a perfect original condition watch. i'd also love to hear thoughts on this question - seems to be very likely that ebay exemplars have at least some non-original elements. I am curious as to why the 6309-729A F1 models are not included. They are the second generation of the 6309 if I remember correctly. Made up until 1988. This is one that has been modified a bit. They are quite difficult to find - whatever the model - in original condition. The 6309 slim case is mentioned in this post but unfortunately the pictures have gone. Most of these you see on eBay have fake dials, aftermarket inserts and hands and maybe even incorrect movements. The 7290 at the top is mine and they're a gorgeous watch. I'd love a near mint Pepsi bezel version next. The caseback to my 7290 has F1 within a small square stamped on it after the movement-case reference. Last edited by GuyJ; 02-17-2017 at 07:54 PM. 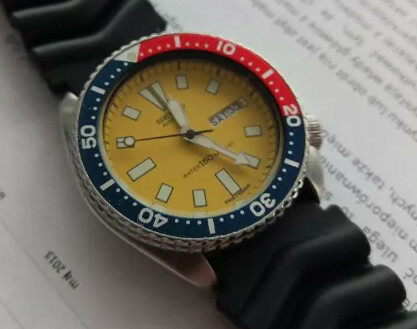 Was there a 6309-7290 with yellow dial and pepsi bezel? I came across some for sale and wonder if they are modded. Last edited by brunoslaw; 02-20-2019 at 04:55 AM. Thanks for this 110% helpful, extremely thorough guide. Thanks for this - lots to digest! !